For whatever reason, this is a post that has taken me quite a bit of time to get around to writing (which is evident by the fact that I'm writing a resolution post a month and a half into the new year). I knew the general gist of what I wanted to write about but had so much trouble putting down my thoughts into words. Basically, I wanted to make a few resolutions for my own little corner of the Internet here. While my blog might not be big in size it holds a very special place in my heart. It feels like I've been blogging forever, when in reality it's been a little less than a year since I first hit publish on Blushing Wit. Recently I've hit a bit of a rut creatively, a large part of which came from me getting a bit down on myself about this here blog. When I first started blogging I honestly can say that I did it for myself because it really brought me a lot of happiness. I blogged for myself and because I had fun doing it. Somewhere along the way though I seem to have lost that sense of fun, and started leaning way too heavily on statistics. The number of followers, comments, positive feedback...while I really should have just taken every single one as a happy little thing, it started becoming a bit of a rabbit hole. A large part of this is my own personal problem. I'm a bit of a perfectionist, and when I don't feel that I'm succeeding at something it always brings on a great amount of anxiety (though anxiety is a prevalent force in my life either way). With blogging, it can sometimes be easier to look at the quantitative to judge success instead of the qualitative. So I became a bit down on myself about the whole thing when I came across this amazing post from the lovely Rebecca of From Roses (a blog everyone should be reading). I really recommend everyone give the post a read, because I feel it could benefit anyone and everyone, but the gist of it is that success cannot be judged on a uniform scale. It's going to be different to everyone and in every situation, and so it's up to us to determine what success is ourselves. Rebecca emphasized that it shouldn't matter what others deem successful, it what we think of ourselves that really counts. The post really hit home for me and made me realize that I need to take a step back and put everything about blogging in perspective. It started out as a fun hobby and started becoming a lot more stressful than it needed to be. All of that said, I decided to make a list of resolutions for the year as far as the blog is concerned. 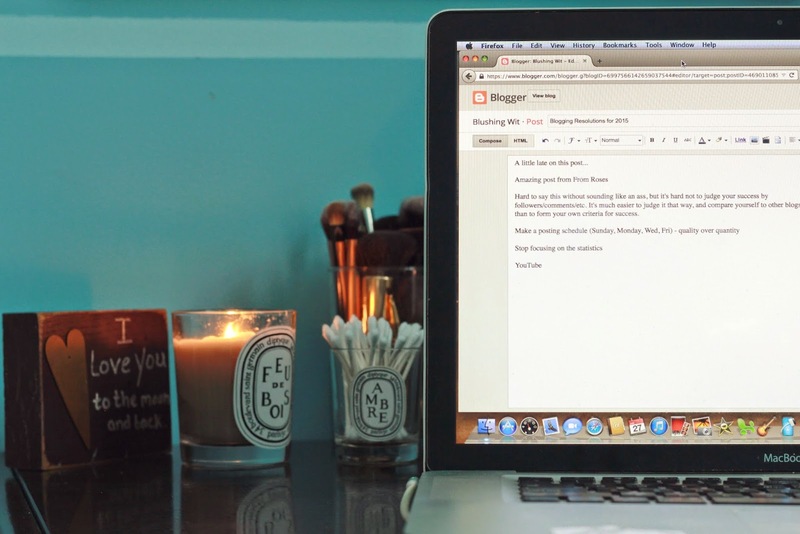 Create a blogging schedule. My current plan is to blog at least three times a week, with (hopefully) new posts every Wednesday, Friday and Sunday and, perhaps, an extra post thrown in there on occasion. Start YouTubing. This is something I really want to do, and even started to at the beginning of last year. I didn't keep up with it which is something I really regret. I can't say I plan on having many videos but I would like to film just a few every once and awhile. Stop focusing on the statistics. When I first started blogging I was overjoyed when I realized I had one reader that wasn't part of my immediate family or friend group. I promised myself I wouldn't get stuck obsessing over statistics...but I did. It makes blogging much less fun and, especially when it's just a part-time hobby, it really shouldn't matter. Take a photography class. Alright this only partially has to do with the blog - I'd love to learn more about my DSLR regardless. But it would be nice to learn more and be able to improve my photography a bit. Reply to each and every comment promptly. I honestly get such joy from reading any comments you guys leave - you have no idea how much I love reading them! I try and reply to each comment but know that it can take me a bit of time to do so. I'd love to be able to get back right away each time! Take more pictures of myself. Something that terrifies me to bits - I'm not photogenic nor can I pose worth a damn. But I'd like to put those thoughts aside and feature more faces of the day and such. I have similar resolutions for my blog this year...except the YouTube part. I kinda want to transition into more of a photography blog so I've been working a lot on my camera skills. Also - if you're looking for a class to teach you a bit about your camera & get you more comfortable being in front of the camera, check out Vivienne McMaster's Be Your Own Beloved. Lots of good stuff there.